Bowling Ghosts are ghosts encountered by Luigi in Luigi's Mansion. In Luigi's Mansion, Bowling Ghosts are fairly common. They resemble Gold Ghosts in shape, but are yellow, have longer, green eyes, and the points atop their heads curve downward instead of pointing straight up. Bowling Ghosts haunt the corridors instead of the rooms, except in the PAL Hidden Mansion where four appear in the Telephone Room, and are usually found along with Ceiling Surprises and in later areas Purple Bombers. They throw bowling balls at Luigi, trying to trip him. They are one of the weakest ghosts in the game as they have zero HP. Even if the player wards them off with the Poltergust 3000 or an element, they eventually return. They are gone when an area is finished, just as any other ghost. Bowling Ghost also appears in Mario Power Tennis in the minigame Terror Tennis as a ball boy. 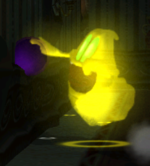 Along with Gold Ghosts, they appear in Mario Party 8 in the minigame Specter Inspector. This page was last edited on December 12, 2018, at 19:52.